Dark red to brown; 1/8″ long, flat, broad oval shape with 8 darker legs. Deer ticks are often found near wooded and highly vegetated areas. They prefer to dwell in grass and shrubs where animals are most likely to pass by. 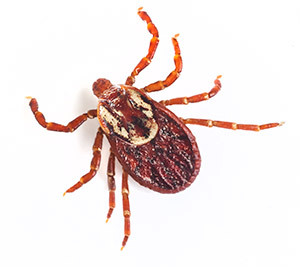 Like all ticks, they’re known for being vectors to spreading bacterial diseases and Lyme disease. These ticks like to feed on the blood of white-tailed deer, which is why they are called deer ticks (also known as blacklegged ticks). They’ll also feed on squirrels, raccoons, skunks, mice, dogs, birds, and humans when deer are not readily available. If you’ll be outdoors in settings prone to ticks, wear long-sleeved shirts and pants. Light colored clothes make ticks easier to detect. Tuck pants into socks. Use a tick repellent containing DEET. Wash clothes immediately after returning indoors if you suspect deer ticks. Ticks are difficult to control, and the services of an experienced professional are recommended. Treatments may be necessary on a regular basis in areas of your yard where ticks are found. If you find a tick, use tweezers to gently pull straight up away from the area on the body to which it is latched.